There are cakes and then there are great cakes. This particular cake being one of the softest, moistest and flavourful cakes that I have ever made falls into the latter category. When I set out to make this cake after a reader request and after being surprised and shocked with myself for not yet having a marble cake recipe here, I was not prepared for this outstanding result! An old hand at making cakes now I just need to look at ingredients and arrive at possible estimates of ingredients to get a good outcome. I did the same here, walked into my kitchen and looked at some ingredients and thought of other missing ingredients and decided to use whatever was on hand (which is quite unusual for me). I had to put that extra home made yogurt sitting in my fridge to good use and decided to use some of it in the cake too. When I unmoulded the cake from its pan with bated breath a perfectly formed cake in sight was to be the highlight of my day (which is also surprising since the 10th of March 2009, most of my day’s highlights have to do with my little Hari). That was the first step accomplished. When I got through shooting the entire cake with a very restless just about to be 4 young man wanting to taste the cake and finally cut the cake, my heart welled with even more joy with the incredible softness and texture of the cake. When I immediately got a call from my friend (who usually sends me an message and will never call during her nap time) saying how good the cake was and how eager she was to try the same and when my husband polished off the extra cake that I had sent for a visitor at his studio, the final step of the taste test got its stamp of approval. I always say that it is easy not to miss eggs in baking, but with this cake I will go a step further and say that with a recipe like this, there is actually no need at all to use eggs, considering the flavour, moistness and texture of the cake. One of the missing ingredients from my usually well stocked pantry was cooking chocolate. I did have a bar of good quality callebaut white chocolate but the little fellow insisted that he wanted dark chocolate sauce. So, I quickly whipped up a fudge sauce with just three ingredients which took me three minutes to make. This recipe is for those who may not have cooking chocolate at home (most people have cocoa powder though) and ofcourse those short on time. You could serve this plain as a tea or coffee cake dusted with icing sugar or make it a celebratory cake by pouring fudge sauce over it and serving it with berries or candied or roasted nuts. 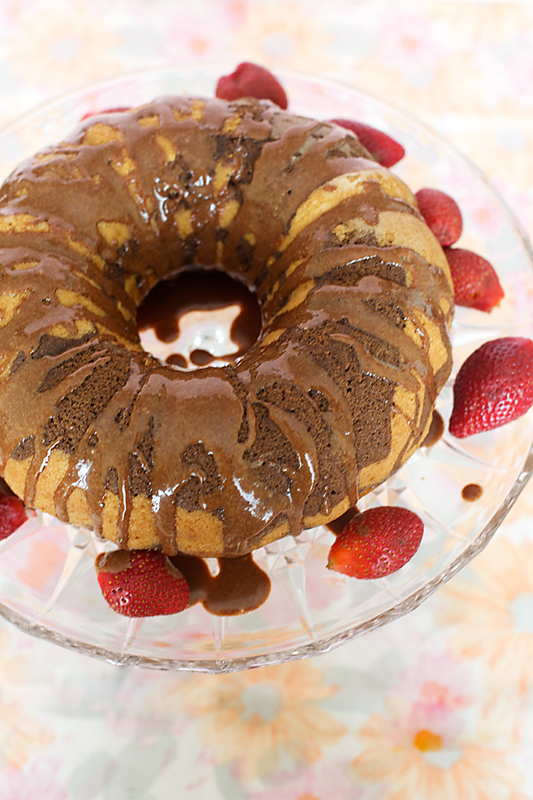 With the flavours of both vanilla and chocolate, this cake is sure to win many hearts! In another bowl put in the hot water and sugar and blend with a mixer until the sugar partly melts. Quickly stir in the oil and the yogurt and mix well. Stir in the liquid ingredients into the dry ingredients, add the vanilla extract and mix well using a hand mixer until you get a smooth batter, about 3 to 4 minutes. Divide the batter into 2 halves. Put in the cocoa powder and extra water (1 tbsp castor sugar if desired) into one half. Mix well and beat for a minute until the mixture is smooth. Now place alternate ladles or spoonfuls of chocolate and vanilla batters in the pan. When all the batter is in the pan, using a knife, make swirling pattern through the batters to get the beautiful marble design. This is quite exciting to do and you might have to stop yourself in order to over do it or else you might have one uniform mixture or batter. Bake in the middle rack of an oven. After 15 minutes lower the heat to 150C/300F and bake for 45 minutes more or until a skewer comes out clean. In a sauce pan, heat the cream and bring to a boil. Take off the heat, stir in the rest of the ingredients and whisk until smooth. 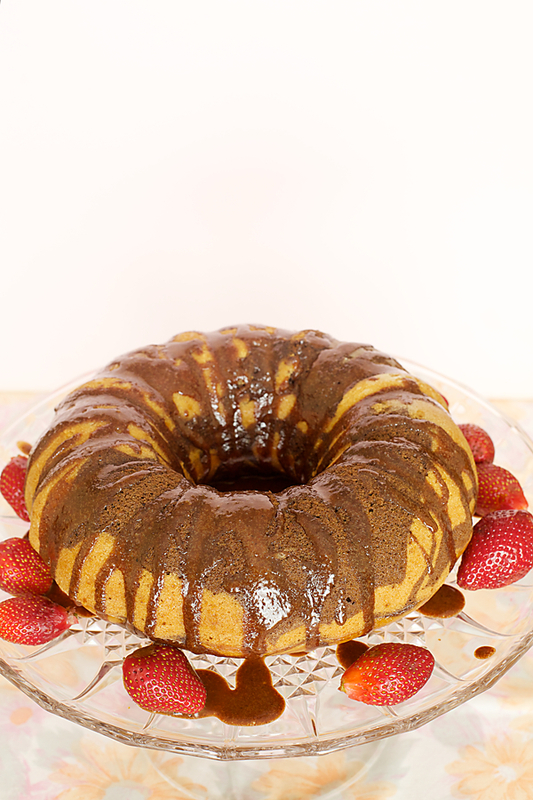 Serve the cake dusted with icing/confectioner’s sugar and serve as a tea or coffee cake or pour the fudge sauce over the cake and serve with berries or candied nuts and make it a celebratory cake. Beautiful recipe and perfect timing Anushruti !! Hi Anushruti, Bundt cakes are so pretty no? Especially boys love them. Here is my mine, made it for my nephew. This post was about the decoration. 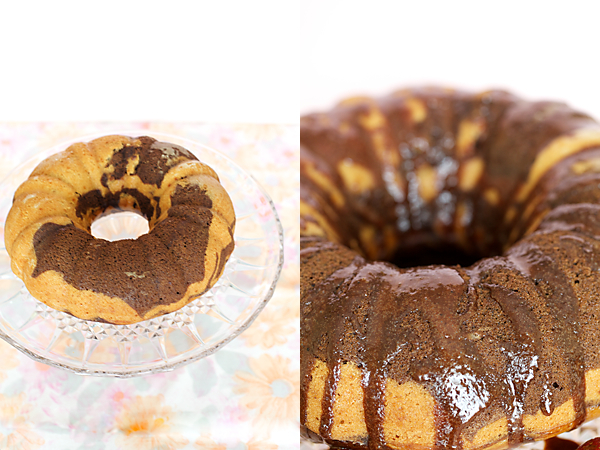 On reading your post I remembered I am yet to post the cake recipe, its quite similar to yours. I too don't let eggs stop me from baking goodies. 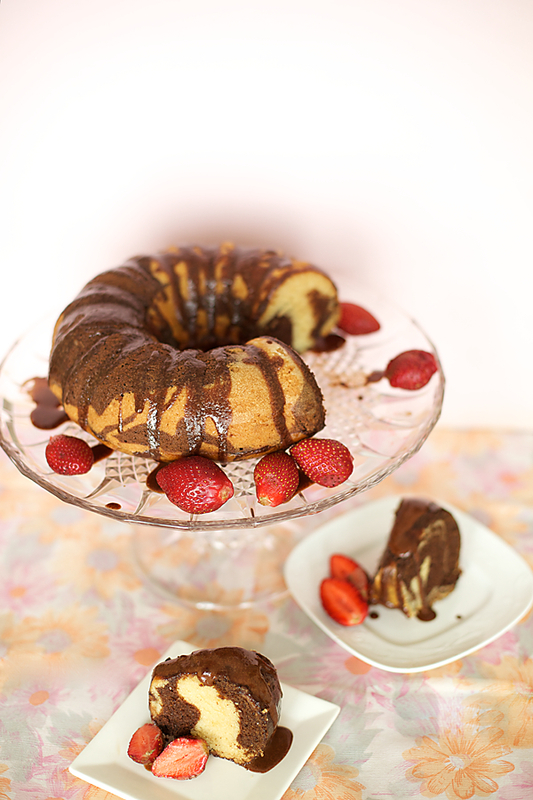 So many recipes come out beautifully without eggs, my marble cake too was addictive if I may say it myself but its very rich. So will have to make it only on occasions. Ooh! 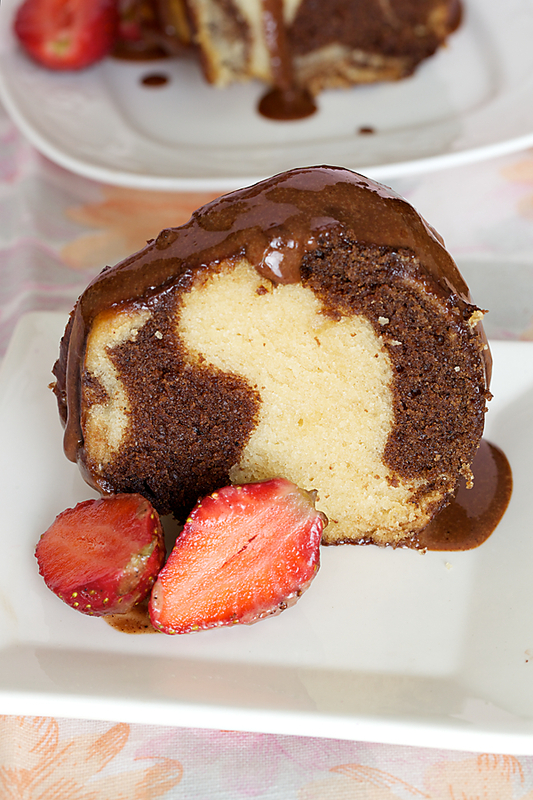 i've been looking for the perfect marble cake recipe!.. One of my happiest food memories is from a visit to a tea estate in Valparai. 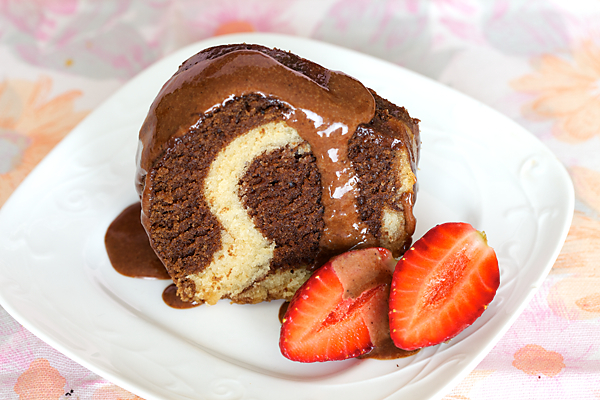 We were served a gorgeous chocolate marble cake and a silver sauce pourer (I am sure there is a fancy french name for this) full of warm creamy vanilla bean sauce. 🙂 . Will be making this soon! Yay…another wonderful cake which will be added to my recipe book. Ive never used yoghurt but have used buttermilk. Hey, Anushruti. Me again. I am thinking of using this recipe also ('also' 'coz am definitelt making this as is!) as a base for a cream cake. Do you think it'll work just as well minus the cocoa? Will there be any other adjustments needed in the recipe? Thanks! vidya: That sounds like an awesome memory! I have some fond memories there too. Shoba: Yes it can be replaced with any neutral smelling vegetable oil. I like to use rice bran cause I feel it imparts a certain flavour to my cakes. It is easily available nowadays! ruchika: I have mentioned in the recipe that you can use any round pan. Use any neutral smelling oil here, I wouldnt suggest olive oil here which has a strong smell to it. Pooja: Just replace the cocoa with plain flour. I think this would be a great base for a cream cake too. Just made this and plied it with your recipe of a chocolate ganache…I didnt have a proper mold so i made it with a kadhai and glass so this has been a lot of fun:). thanks so much for all your recipes…its just so much fun to see my twenty months old wait for her cake and cookies and some of those goodies are a result of all the knowledge you share so freely. This looks great! Can I substitute granulated sugar with regular powdered sugar? Thanks for the quick reply, Anushruti! 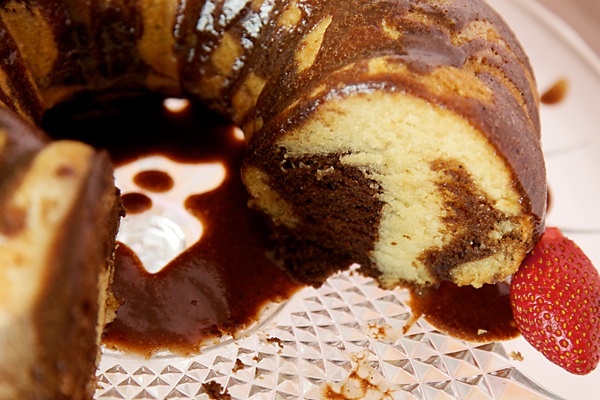 Such a beautiful cake… I always love the patterns in a marble cake. Such a joy! 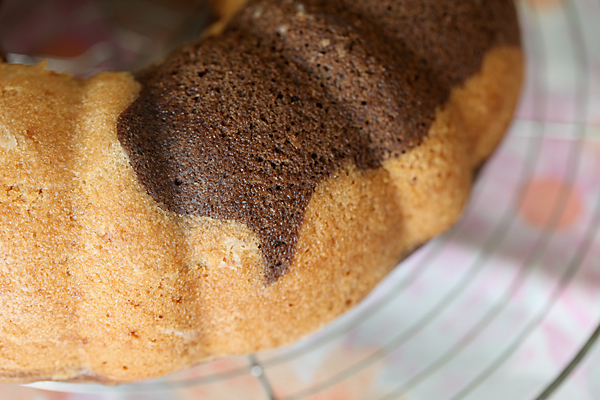 What a lovely texture, the chocolaty swirls make the cake just right for a perfect party treat! Should I have added more vanilla essence? rituparna: That sounds like fun! I coudnt have thought about it in the absence of a pan. Glad you appreciate my work here. It requires lot of time and use of other resources and its nice that some kind people liek you recognize it. Rk: No if you do you will have to increase the quantity of powdered sugar. Its better to use granulated sugar here. Ramya: Not sure what you did wrong..increasing the vanilla essence wont help! 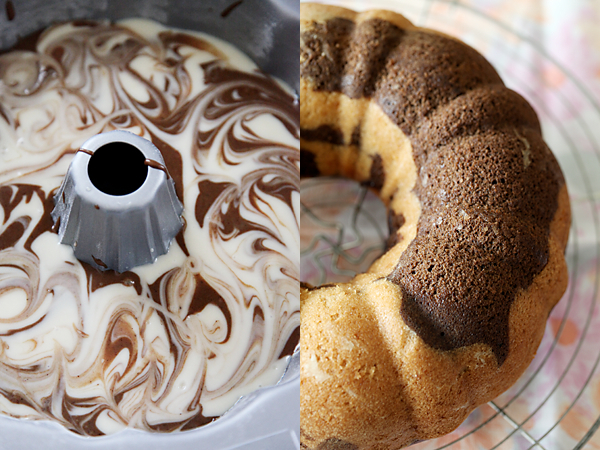 Hi Anushruti, gorgeous marble cake…can't wait to try it out. I had a question on the hot water. Could you please confirm that I add 1 cup hot water to the sugar and the 2 tablespoons of hot water, stated in the ingredients, is added to the cocoa and one half of the batter. Your recipes are truly amazing…love them! Nice recipe but plz can u confirm on the cup measure of gran.250 ulated gar. Is it a 250ml cup or a smaller cup. As 2 250 ml cups of sugar is almost 500gms. Nice recipe but plz can u confirm on the cup measure of gran ulated sugar. Is it a 250ml cup or a smaller cup. As 2 250 ml cups of sugar is almost 500gms. I tried out the cake this morning – came fantastic – the texture and the finishing was superbe. One query though, I use a 250 ml cup for my measurements. I also have a small weighing scale – its a 250 gm one, which I use whenever I make cakes. Your measurements of maida fitted in perfectly – each cup was 140 grams which made it 420/3cups of maida. But with sugar it wasn't the same. Each cup of sugar was 220 grams and since the receipe asked for 290 grams, I did use 290 grams only ( I prefer a weight value, since it is more correct compared to a cup value), but if I were to use the cup value, I would have had to use 495 grams of sugar, versus the 290 grams you have used in the receipe. The cake did taste less sweet – after tasting the batter I thought I would use more sugar, but was hesitant because if sugar made the cake hard, I wasn't for it! Other measurements were all perfect. Do clarify, and thanks in advance. Asmita: Thanks! Will keep your request in mind. Tina: You are right. As mentioned add the extra water to the cocoa mixture. Meena: There was an error in the recipe. It is 490 gm sugar. Arti: 21/4 cup is 490 gm. My apologies for the unintentional error. I hope you try the recipe again and enjoy it! made the cake for moms bday was awesome! Thank you!! Spice is abundantly acclimated in all aliment in India irrespective of whether it is north, east, west or South Indian food. And even adopted tourists never footfall aback in savoring the countless varieties of aliment in India admitting they perceived that spices are used. Wonderful cake recipe! I do bake but not too much on cake since it requires lot of fat and sugar! But once in a while it is ok. Your clicks are just professional and kudos to you! I will try this one sooon. Lovely recipe! without any egg, just right for me. Can I substitute cocoa powder with Hershey's syrup? Will I have to reduce the quantity of water? Fabulous like everytime. The photos are so tempting that i wud like to make it rite away but just waiting for Mothers day. Im sure it will be a treat for my kiddo. Well a query can i use normal sugar instead of brown in the fudge sauce?will that make changes to the flavour or consistency? nandini: I always feel happy (more so) when my cakes are baked for mothers! Mina: It's better to use cocoa powder for this recipe but you could use hershey's syrup too by reducing the water. a request: can u give the recipe for an orange cake? Garima: Thanks. Will surely try and post a recipe for orange cake. Your cake looks awesome….& the swirl pattern is simply perfect! !…I find all your recipes amazing & tempting…you've very aptly named your space "divine taste"…:)….Have a small query: can we substitute yoghurt with buttermilk? wow awesome cake sooooooooooooooooooooooooooooooo good. I used this recipe to bake a cake and cupcakes for my mother's birthday and it came out wonderfully. I've been searching for an eggless cake recipe for really long, and I've finally found a great one. Thank you so much! How does adding yogurt help in baking the cake? Is it okay if I donot add yogurt in the cake? I am going to be trying this asap.. Jus a little clarification.. I will be using a microwave for the same? Will it turn out as good? Or do i need to make any changes?? Hi Anushruti, I am thinking of trying this recipe out next… please advise if it would make a difference if I used buttermilk as opposed to sour yoghurt / sour cream as the sour cream in SA is very sour and I am worried that it might spoil the recipe. Thank you! Sushi: In this recipe yogurt plays a major role by providing, binding, moisture and soft texture. This cake wont be the same without yogurt. Swati: Sorry, I never use a microwave oven so I cant tell you how it would be but a lot of people use my recipes to bake in a microwave oven with successful results. Nisha: Sour cream will do a good job. You could try buttermilk too. I tried this cake yesterday. It is amazing. My husband even took some foe his colleagues. Arthi: That's awesome for a first timer! Thanks for the feedback! I made this for a house party and it was a huge success. Thank you so much for the recipe. I am a novice in baking and this was the third cake that i baked ever.. The texture of the cake was really soft and moist. However, when i transferred the cake from the pan, it broke since the bottom was too moist and a thin layer was still stuck to the pan. I baked it for the mentioned 15 + 45 mins. Would you know what could have caused this? Lavanya: Maybe your cake needed some more baking. Always test a cake with a skewer or a toothpick and if it comes out clean then its done. If the batter sticks to the skewer put the cake back for an additional 4 to 5 minutes. Allow the cake to settle in the pan for 3 to 4 minutes before turning it upside down. And keep a plate/rack over the cake and carefully turn it around. This will prevent the cake from breaking. valli ranajit kumar: Yes you can reduce the quantities in half and bake. Use a small bundt pan. i did bake this cake. reduced the qty by half and tried.. came out very well. 2day is my son'e b'day. since he is in the hostel v sent him the pic as part of our good wishes and blessings. thank u so much for the lovely recipe… i guess the slow cooking(rather baking) for a longer time at a reduced temp does wonders . valli ranajit kumar: Glad this worked for you! Birthday wishes to your son! Hi, I halved this recipe and made cupcakes and frosted with chocolate ganache, turned out very well! Thanks! 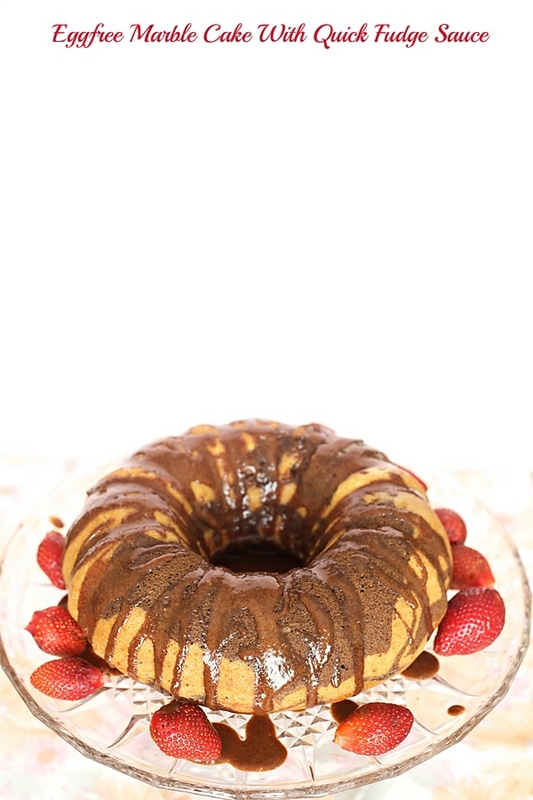 Rithika: I used a 9 1/2" deep bundt pan. Ambika- Yes you can! Depending on the size of your liners you should get about 25 to 30 cupcakes. Hi…I have a question….can i increase the amount of sugar in the recipe….will it make any difference to the batter consistency n of-coarse the end product…. Thank so much for this recipe. I've been looking for eggless recipe and this one came out good right at the first try even though I just started to bake recently. Hi Anushruti! Thanks so much for this recipe. I baked this in two 6 cup bundt pans and it turned out great. The taste, texture, softness and moistness was just perfect. I baked this for a potluck and it was very well received, some couldn't believe it was eggless 🙂 I happily shared your site. I topped this cake with rich dark chocolate sauce and paired with honey roasted almonds with a hint of cinnamon and a scoop of vanilla icecream on the side. P.S. I love your videos on YouTube for Rajshri Food, please keep them coming! Bindi- Great to know that. Priti- Thank you for your feedback! Hi Anushruti -thanks so much the cake was truly yummy !! If I wanted to convert this recipe to an all chocolate one -how much cocoa should i add? Ambika- Please look at my chocolate cake options. Have given the list under your query in my eggless chocolate ganache cake. i would love to try this cake but i dont stay in india and so dont get sour curd here. moreover, keeping the curd out for a day also doesnot make it sour. so can we use normal curd? dipa- Yes you can use regular curd or yogurt. You can also try using sour cream. nandini- I find that the sugar is just right for this recipe and so do many others as you can read in the testimonials above.